Suba Jagannathan’s handcrafted maple tracing board helps kids learn to write cursive letters. Your kid’s a pro at working touch screens. They might have printing blocky letters down, too. Help them take the next step in building written communication skills with Suba Jagannathan’s handcrafted maple cursive tracing board. Through researching educational philosophies and teaching toys, Suba learned that the benefits of cursive writing go beyond being able to draft pretty letters. Memorizing the movements required to produce script actually helps children build fine motor skills. 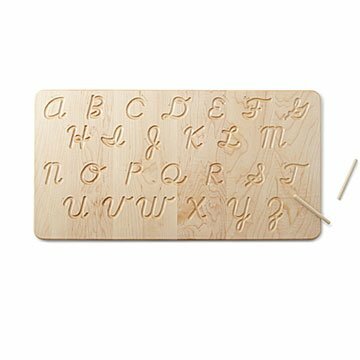 By following the guiding arrows to trace over the upper and lowercase letters etched in the wood, little learners will start to understand the cursive alphabet. Tracing with fingers is a great way to start, and the included wooden “pencil” (a small dowel with no messy ink or lead) lets kids take the next step to practice pen movements. A bonus for parents? The board looks so nice, you won’t mind if it doesn’t always make it back into the toy box. Handmade in Vancouver, Washington. Suba Jagannathan has two passions in life: science and kids. She’s especially passionate about helping children with disabilities. With a BS in information technology and an MS in computational biology, she once had a career in the pharma industry. “I started making some simple toys for my daughter," she said. Next thing she knew, she’d purchased a second-hand scroll saw and was designing a line of wooden, science-based toys. After much research, and practice to perfect her craft, Suba officially started selling her creations when her daughter was 2 years old. “I realized [that by combining] both of my passions I will be able to make a difference in someone's life,” she says. Her goals are to provide the best hands-on learning tools, create toys that are accessible to kids of all abilities, and provide employment opportunities to women and people with disabilities. She lives in Vancouver, Washington, where she works with a small team to create her unique educational products.